The 60 foot Tracked Lifts (Spider 18.90) are available in Ithaca NY, Rochester NY, and Upstate NY from the Duke Company. Tracked Lifts are the choice among many professionals and are considered the most capable and versatile ultra compact manlifts on the market. They utilize simple live hydraulic operating system for unsurpassed reliability. They will fit through a standard door. The tracked undercarriage allows passage over a variety of surfaces including soft, muddy or delicate finished surfaces while avoiding damage done by other types of wheeled equipment. Tracked lifts even allow the climbing of heavy inclines and staircases, heavily sloped or terraced terrain. Simple electro-mechanical limit switches ensures safety during deployment. They can be transported via trailer behind light duty pickups, vans or SUV’s. 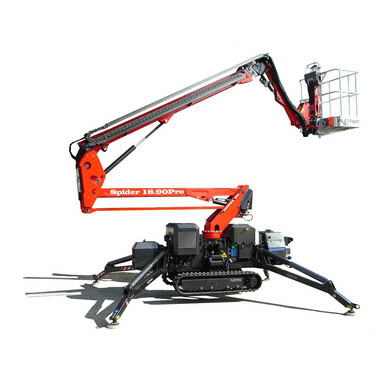 Their versatility accommodates the most challenging situations (e.g., they can be craned or deployed in freight elevators).